No 'Star Wars Day' celebration would be complete without a number of homages to the pop culture phenomenon. 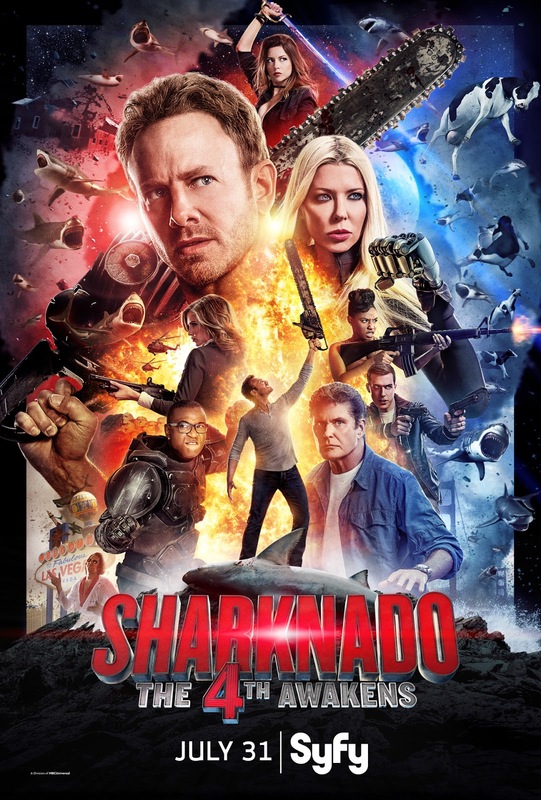 The latest tribute comes from SyFy channel's spanking new promotional poster for their upcoming fourth shark-pocalypse feature Sharknado: The 4th Awakens. As you can see, the poster inspired by A New Hope has our fearless hero Fin (Ian Ziering) along with the returning April Wexler (Tara Reid) whose fate will be determined via online poll. Hard to miss is the appearance of the Hoff, David Hasselhoff who reprises his role of Gil Shepard. It's more chaotic killer shark mayhem. It's five years after the East Coast was ravaged in Sharknado 3. Fin and his family have been sharknado-free but of course a sudden wave of violent shark-induced catastrophies have occured in new and weird ways that has them in danger once again. New additions to the campy horror disaster franchise include Gary Busey, Tommy Davidson, Imani Hakim, Cody Linley, Masiela Lusha and Cheryl Tiegs. There's also an eclectic list of cameos that sound like they belong on The Apprentice. Robert Herjavec and Lori Greiner (Shark Tank), Kym Johnson (Dancing with the Stars), T’Keyah Crystal Keymah (In Living Color), Duane Chapman (Dog the Bounty Hunter), David Faustino (Married with Children), Stacey Dash (actress? and Fox News talking head), Vince Neil (Motley Crue), Wayne Newton (aka Mr. Las Vegas), and Baywatch stars Gena Lee Nolin and Alexandra Paul as scientists and astrophysicists. So as you can see, Sharknado: The 4th Awakens is more of the same zany fun you'd expect. Watch it when it premieres on SyFy, Sunday, July 31 at 8PM ET/PT.